The famous biographer Vasari was certain that this fresco in the Sistine Chapell was made by Luca Signorelli. Present day art historians disagree and claim that most of it was made by Bartolomeo della Gatta. 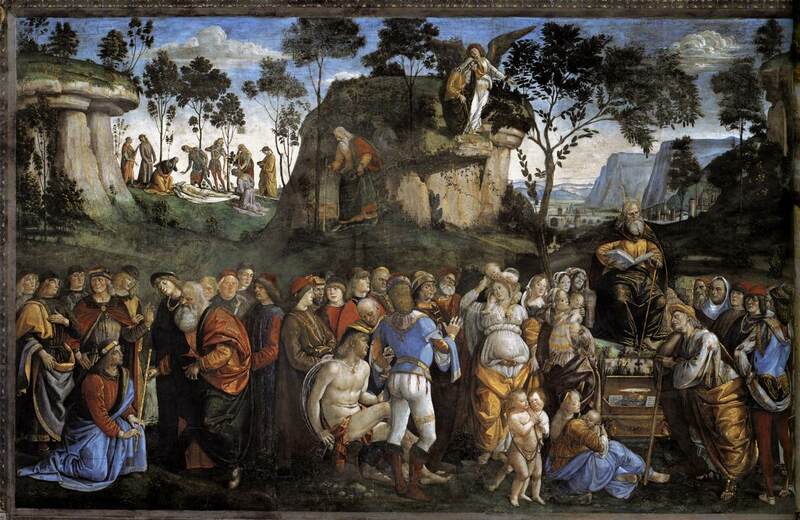 Only the more dynamic figures would be Signorelli's. Signorelli was not on the list of four artists who at first were commissioned to decorate the walls of the Sistine Chapel. On the right Moses reads to a listening crowd (Deut. 29-30). At his feet is the Ark of the Covenant, with the two tables of the Law. On the left he hands over his leadership to his succcessor Joshua. In the center of the background Moses is on Mount Nebo. An angel shows him the promised land, which he will never reach. On the left his people mourn his death.